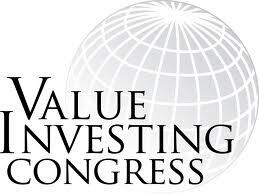 We're pleased to present notes from the Value Investing Congress taking place today and tomorrow. 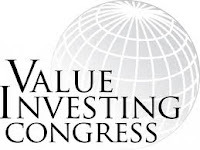 Today's notes include presentations from John Burbank (Passport Capital), Lee Ainslie (Maverick Capital), Francisco Parames (Bestinver Asset Management), and Amitabh Singhi (Surefin Investments). Below is a quick summary of today's ideas. We'll also cover tomorrow's presentations so be sure to receive our free updates via Email or our free updates via RSS. Burbank's presentation focused on the 'math of democracy.' His talk started off quite grim as he believes the US government's current level of spending is unsustainable. Burbank feels the US is changing and must now be viewed as an emerging market. This is along the lines of what Burbank presented at the Ira Sohn West Conference recently as well. Over the longer-term, he believes we're headed either in the direction of Argentina or Germany. The most jolting claim in Burbank's presentation was the notion that classic bottom-up stockpicking is dead. This is intriguing of course because the majority of attendees at the VIC employ such a strategy. Burbank approaches things a bit differently, utilizing a top-down approach and actually feels that the next two years in the market could be more tranquil than currently anticipated. In terms of portfolio allocation, Burbank likes being long countries with high political/economic freedom. He likes a group he refers to as the "new CASSH" referring to Canada, Australia, Singapore, Switzerland, and Hong Kong. Conversely, he likes being short developed countries with large debt. In terms of specific positions, Burbank mentioned Passport's largest position as Riversdale Mining (ASX: RIV). He believes gold is a 'must have' investment, but preferably via the physical asset and *not* through the exchange traded fund, GLD. David Einhorn of Greenlight Capital has also in the past mentioned that owning physical gold is cheaper than GLD (due to expenses). Passport Capital currently has an 8% position in physical gold as it is a much cheaper way to play the metal. Burbank is quite fond of hard assets/commodities and wants to buy assets that China needs. Specifically, he likes potash for that very reason and has big stakes in Mosaic (MOS) and CF Industries (CF). Additionally, he has a position in Potash (POT), the company subject to takeover bids from BHP Billiton. Recently, Dan Loeb's hedge fund Third Point disclosed a new stake in POT. Burbank also has a major investment in coking coal in Mozambique. The fund manager also said he is long steel and short copper. In terms of other positions, Passport also owns big blue-chips with yield including Exxon Mobil (XOM), Kraft (KFT), Dr. Pepper (DPS), and Microsoft (MSFT). Lastly, the hedge fund manager mentioned that individuals who understand capital allocation need to boost their contributions to political candidates. Passport Capital's portfolio is detailed in our newsletter, Hedge Fund Wisdom. Ainslie's presentation focused on the 'case for technology.' The Maverick Capital founder noted that the investment landscape is very different now than it was two years ago. The hedge fund manager says this is a tough market for stock pickers and that we're seeing the highest correlation among large-caps since the 1930's. Back in 2009, low quality and small-cap stocks (higher beta) rallied furiously and led the market rebound. Interestingly enough, these low quality names have also led the market thus far in 2010 and that fundamentals haven't played an important role. According to him, the most attractive opportunities currently reside in high quality, large-cap, lower beta stocks. In essence, he's targeting companies with solid balance sheets and high return on equity. Currently, Ainslie believes technology stocks are the cheapest they've been in 20 years. He cites their high free-cashflow yields and points out that 'growth' tech is beating out 'value' tech. He believes the weak US dollar is helpful to technology companies. Ainslie also points out the large amount of cash on their balance sheets and opines that this cash should be deployed via acquisitions, share buybacks or dividends to benefit shareholders. Maverick's fondness for technology is an investment theme of theirs we've tracked since the first quarter of this year. In terms of specific names, Ainslie emphasized Commscope (CTV) as a good hold through 2012. This is one of the five major tech stocks in his portfolio. The others include Marvell Technology Group (MRVL), Intel (INTC), Microsoft (MSFT), and Dell (DELL). Maverick Capital is currently 17% net long technology, their highest exposure ever. Lastly, shifting to the heated topic of for-profit education, Ainslie was positive on the sector. But then again, we already knew that considering his sizable long of Apollo Group (APOL) disclosed in Maverick's portfolio. Singhi has returned 29.8% annualized since inception in mid-2001. He focuses on India with his investments often buys 'cigar butts' and plays special situations. His current portfolio is comprised of 12 positions (most of which have single digit P/E ratios as he typically doesn't like to pay for growth). At the Congress, he spouted off numerous ideas. Firstly, he mentioned Larsen & Toubro as an infrastructure play in India. This company trades as LTOUF on the pink sheets and as BOM:500510 in India. Secondly, he likes Housing Development Finance Corp as a play on housing upgrades (traded as BOM: 500010 in India). The interesting thing about some of Singhi's picks is that they are stocks trading near highs and some would argue that valuation is stretched here. Singhi does not own Larsen & Toubro because it trades at a very high multiple, 40x earnings. He is recommending superbly run and very well known companies, though. Singhi's main idea today was Balkrishna Industries Limited (traded in India as BOM:502355), a tire maker known as BKT. The company trades at a P/E of just 7, but Q1 in FY '11 was slow. His last idea was Agrimax. Parames is Spain's largest money manager at $6 billion under management. He is a follower of the Austrian School of Economics. From an investment standpoint, he typically looks for good businesses with strong management trading at a solid price. Currently, he feels the Europe is still a less efficient market than the US. Obviously as a value investor, this could be seen as a welcome development as it can present opportunities. But what's interesting here is that while Parames is based in Spain, he doesn't have a single cent invested in his country. In his talk, Parames said that, "patience is our biggest competitive advantage." He likes to buy family owned companies, something that is much more common in Europe (80% of his investments fit this criteria). In general, Bestinver focuses on strong businesses with high free cash flow yield. At the Congress, he said that he likes BMW Preferred Shares (LSE: 0KF2.L) which currently trade at 3.1x 2012 free cash flow per share. He thinks the preferreds have over 200% upside and he owns 11 million shares (they are thinly traded at around 60,000 shares daily). Parames notes BMW's 7% margins and that this can be improved to 8-10% via better manufacturing operations. He also mentioned CIR SpA (BIT: CIR), through Sorgenia Group, a multi-utility operator in Italy. Also, Parames mentioned Ferrovial which trades on the pink sheets as FRRVY and in Europe as ETR:UFG. He believes shares are worth around 17 euros (the company currently trades around 7 euros per share). *** We'll also cover tomorrow's presentations so be sure to receive our free updates via Email or our free updates via RSS. Long Term Stock Market Cycle: Where Are We Now?